The Panthers have treated Atlanta like a house of horrors over the years – while it may be Cam Newton’s hometown, he has only won twice in six tries 250 miles down I-85; even when the team went 15-1 and Newton won the MVP in 2015, the 1 in 15-1 belong to the Atlanta Falcons. A must-win that could have given them the NFC South to finish up the 2017 season ended in a 22-10 loss that gave the Panthers the fifth seed and a first-round matchup with the New Orleans Saints they would eventually lose. Cam Newton, usually excited to head down to Atlanta, was all business when discussing the matchup, saying that it was “just the next game” and that “it don’t matter” – aside from the fact that it’s a divisional opponent and his hometown, it’d almost be like he never said last year that offseasons are better when they beat Atlanta; certainly, that didn’t apply after last season.  The Panthers have a lot to be confident about after their defensive performance last week in which they sacked Dak Prescott six times and held Ezekiel Elliott to less than 70 yards rushing; watching the Eagles beat the Falcons on opening night revealed that a strong defensive rush to throw Matt Ryan off his rhythm can be successful – although that’s hardly a new formula. Both teams will be without multiple key pieces – both Keanu Neal and Deion Jones were placed on injured reserve for the Falcons, while running back Devonta Freeman is battling a knee injury suffered in the season opener; the Panthers will be without both starting tackles and tight end Greg Olsen heading into the game on Sunday and guard Trai Turner is currently in the concussion protocol – if he doesn’t practice today, count on seeing either Tyler Larsen or UDFA Brendan Mahon starting next to Ryan Kalil. Starting next to that guard will likely be either Chris Clark, who was signed on Wednesday, or Corey Robinson, who the Panthers traded for on cut day to provide depth on the outside. It’s going to be the rookie’s time to shine in Atlanta – a team missing their Pro Bowl linebacker and safety are rife for opportunities for tight ends over the middle and up the seam – Cam Newton said that the rookie has everything you’d want in a premier tight end and there are no excuses from the rookie – second NFL game or not. It won’t just be a matter of being a pass catcher, but a blocker as he helps chip the defensive ends battling Taylor Moton and either Clark or Robinson on the outside. 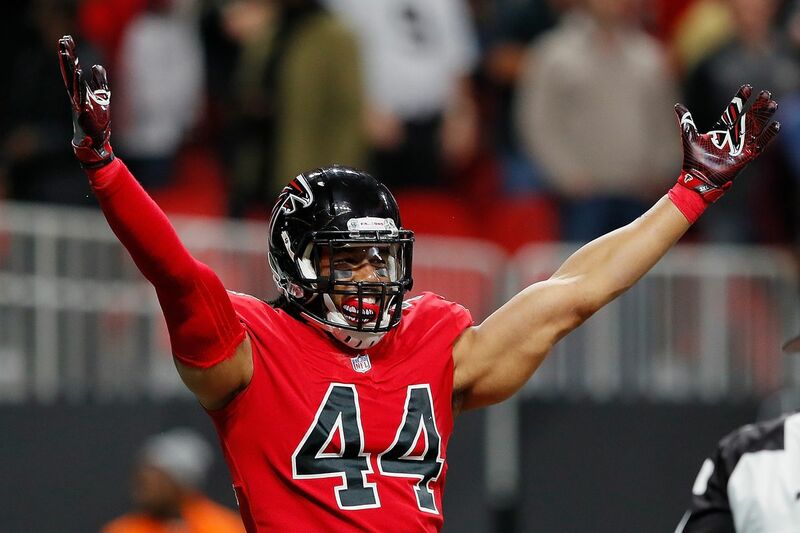 Only a year removed from leading the league in sacks with 15.5, Vic Beasley entered 2018 healthy and ready to fulfill his role as one of the best young pass rushers in the league – after spending some time at linebacker and battling a shoulder injury in 2017, Beasley is expected to move back to defensive end full time this season; he and Takkarist McKinley switch sides, so they’ll both attack the replacement tackles that they’re respectively lined up over. How Moton and Clark/Robinson handle McKinley and Beasley to give time for Cam Newton to find receivers downfield will likely be a marker for whether or not the offense is able to stay on the field, particularly on third down – something the Falcons have struggled with over the past two years, finishing in the bottom third of the league. The Falcons defense limited the Eagles to only 232 yards last Sunday, and they’ll need both the pressure and run fits of Beasley to repeat that performance. 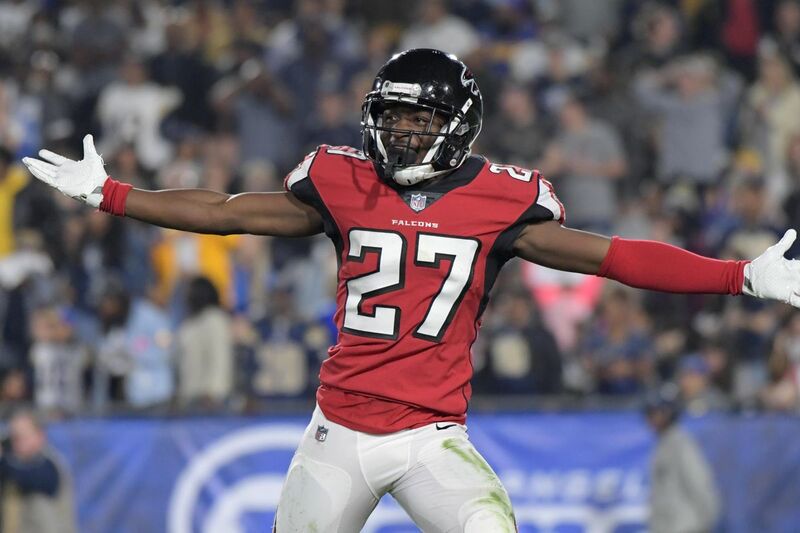 The Deion Jones interception against the Eagles in Week 1 was due to a huge hit by Damontae Kazee that jarred the ball loose from rookie tight end Dallas Goedert – it’s that kind of physicality that the Falcons appreciated from Kazee in the preseason and they’re hoping he can bring to the defense as he replaces Pro Bowler Keanu Neal in the secondary. The team isn’t putting too much pressure on either Kazee or Duke Riley, who will be starting for Jones, to fill their shoes, only to play their own game. 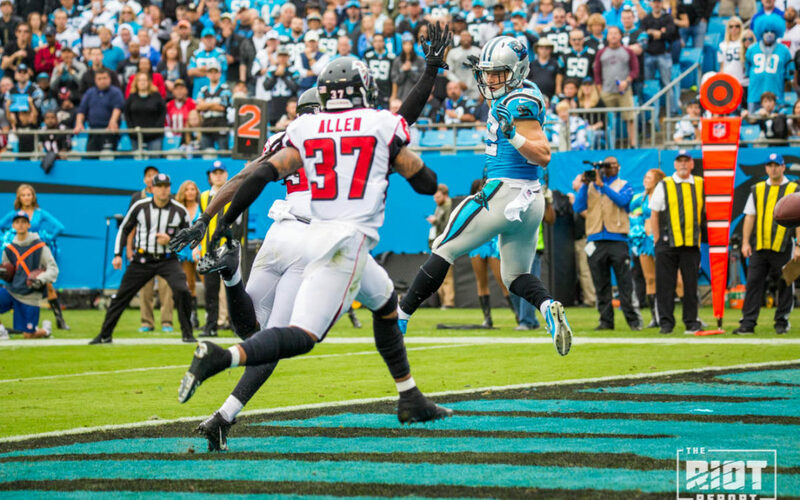 Kazee will get the start at strong safety with Ricardo Allen moving over to free safety – with Greg Olsen rebreaking his foot, the Panthers will look to rookie Ian Thomas to take advantage of the former fifth-round pick getting only the second start of his career. Last week, the Cowboys didn’t have a lot of success moving the ball, but almost 40% of their receiving yards came from Cole Beasley operating out of the slot – while the Falcons don’t have a dedicated slot receiver like Beasley, expect Steve Sarkisian and Dan Quinn to move Julio Jones, Calvin Ridley and Mohammed Sanu into multiple formations to try and get the matchup they desire – there will be snaps where Munnerlyn is forced to press bigger receivers, and how the nickel corner denies these pass catchers a free release will have a large impact in the passing game. 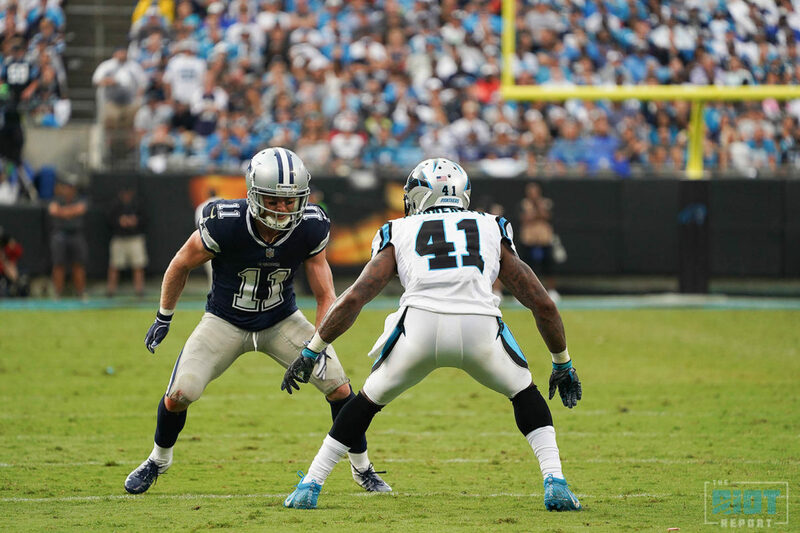 Even a second of extra time needed will be costly with the strength of the Panthers’ pass rush – if Munnerlyn does end up matched up in man coverage with one of the Falcons’ top receivers, he’ll need to be able to hold his own even with his significant height disadvantage – each of the receivers have at least three inches on the ten-year vet. 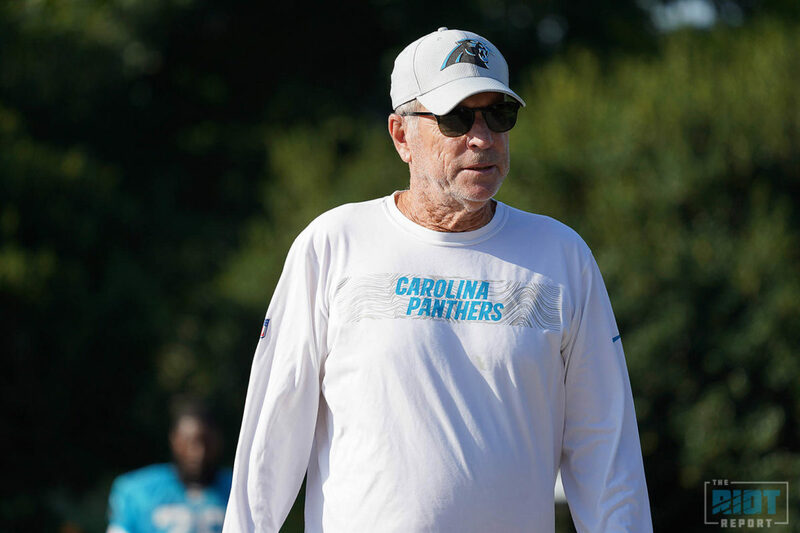 With over a quarter-century of coaching under his belt, this Week 2 matchup is not the first time that Norv Turner has gone into a game with a banged-up offensive line – expect him to use quicker routes, tight end chips and misdirection runs to buy his quarterback some extra time with four of the five offensive linemen expected to start on Sunday being replacements – the vaunted Norv Turner offense had trouble getting off the ground against the Dallas Cowboys, and Beasley and McKinley will offer much of the same issues from a protection standpoint – the Cowboys had three sacks last week and found ways to consistently harass Newton. If the Falcons get consistent pressure in the first half, expect Turner to make halftime adjustments to counter. James Bradberry has had success the last three times he’s faced off with one of the best receivers in the league who lives 250 miles south on I-85; only 258 yards on 15 catches over three games ends up with an average well below Jones’ career numbers. 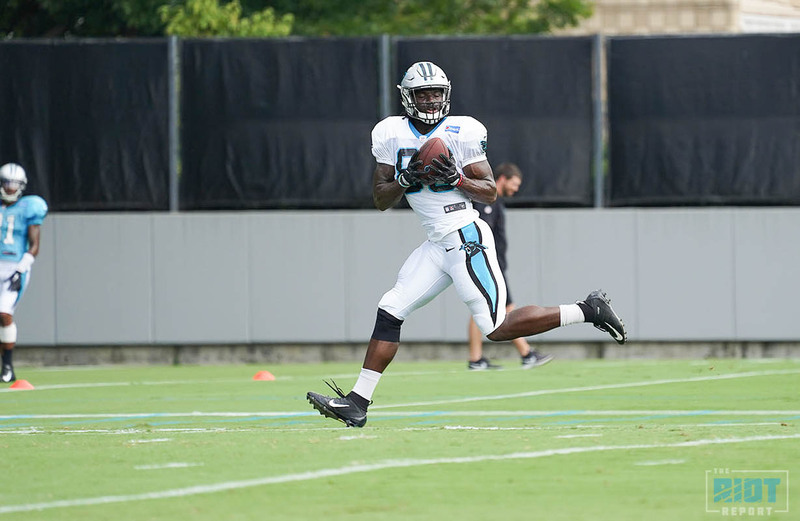 While everyone remembers the 300 yard game that came in Week 4 of Bradberry’s rookie season, the Panthers’ #1 corner only played one series before leaving with an injury in that game; Bradberry is still extremely familiar with Jones and welcomes the challenge of facing one of the best wideouts in the league – the first of three huge tests for the third-year corner, who will follow Julio Jones with games against AJ Green and Odell Beckham, Jr. 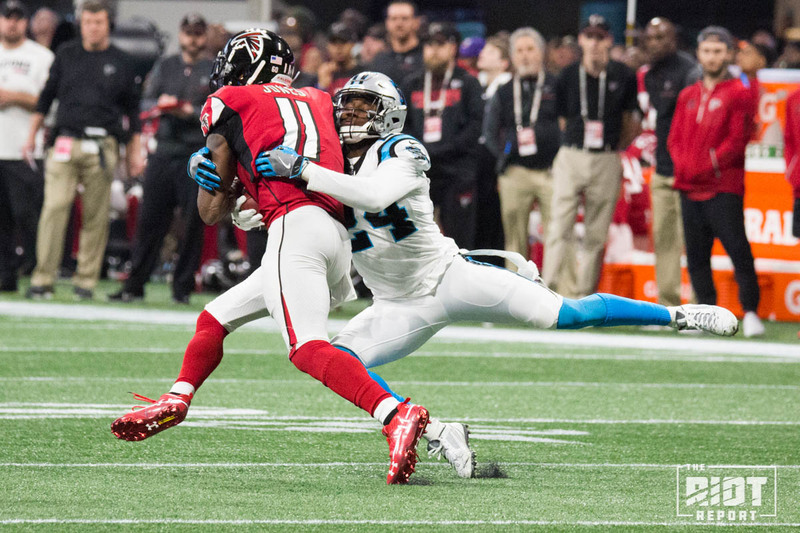 But Bradberry still remembers Falcons fans chanting Julio’s name as Jones went off for 12 catches and the most receiving yards allowed in Panthers’ franchise history – he’s determined not to allow repeat performance. 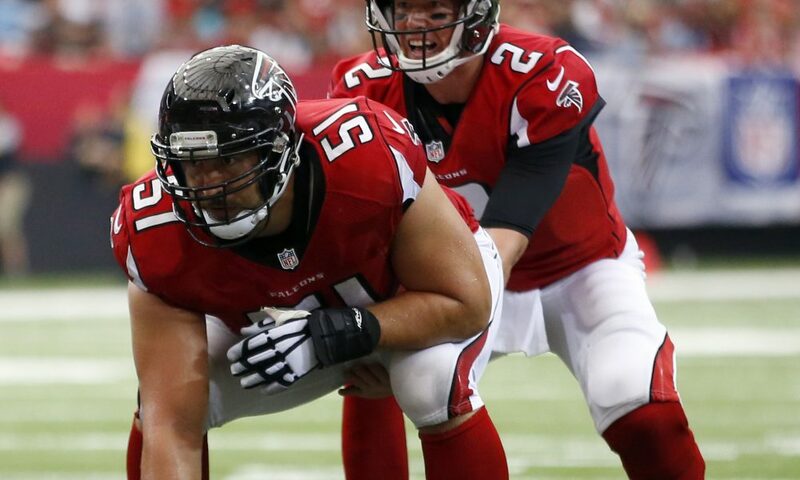 Poe and Mack went face-to-face in practice last season – the two big men are certainly familiar with each other; while Poe has 36 pounds on Mack, the Falcons’ stalwart center will use his quick, strong hands to try and keep Poe at bay. But a player that started 16 games for a divisional opponent last year can certainly help in the mental game as well. Ron Rivera won’t say it, but the Panthers have suffered a position catastrophe along the offensive line – both starting tackles are on injured reserve; the leader when they began training camp to start at left guard is coming off knee surgery and might be the first backup at four different positions; their original backup at right tackle has been released with an injury settlement, and Trai Turner is currently in the concussion protocol. 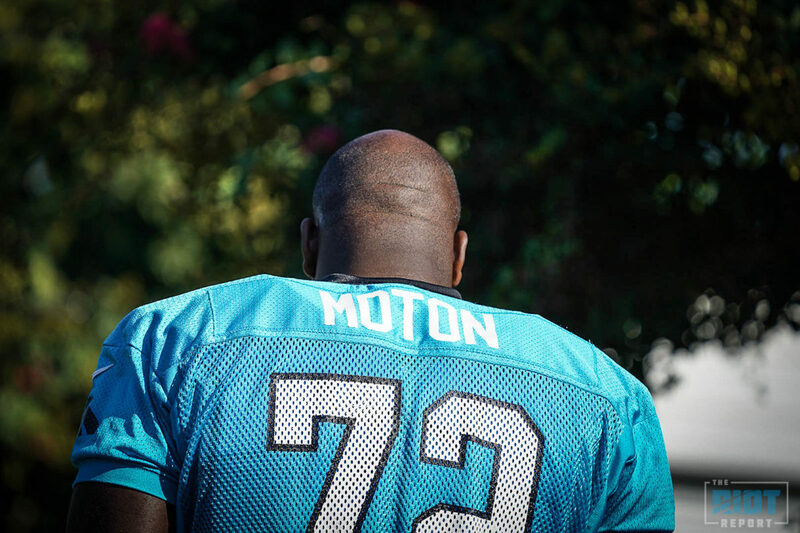 Neither of the leaders to start at tackle, Corey Robinson and Chris Clark, were on the roster two weeks ago; Taylor Moton, a natural right tackle, started last week on the left side. Oh, and the Falcons’ best pass rushers will be lining up against them on Sunday. 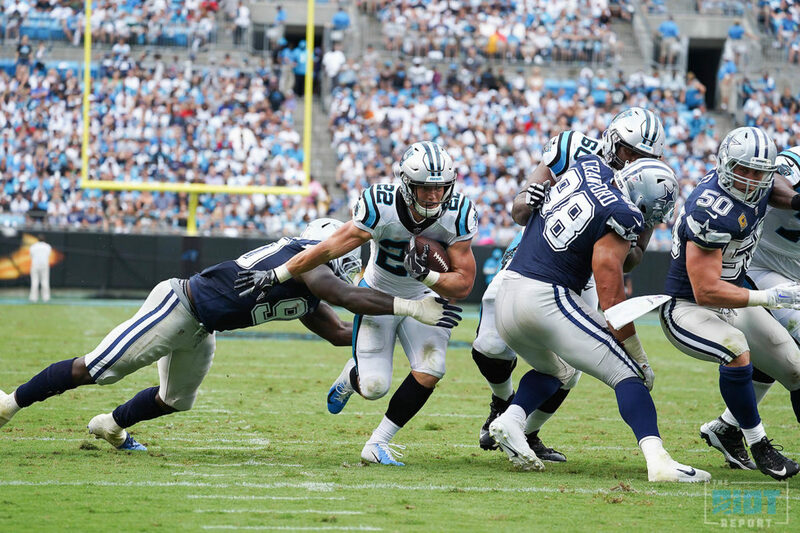 With Deion Jones missing, expect to see a lot from Christian McCaffrey in the middle of the field – the running back led the team in receptions and receiving yards last week and it wouldn’t be a surprise to see the second-year player as the leader at the end of the weekend. In two games last season, the running back touched the ball 35 times for 148 yards and a score – but look for McCaffrey to attack replacement middle linebacker Duke Riley to try and improve on those numbers this season; CJ Anderson is a candidate for passes over the middle as well. Don’t think the Panthers can’t look to check it down if CMC is on the bench.